“Our iceberg is melting”, by John P. Kotter. Published 2005 by Spencer Johnson. The fable, “Our Iceberg Is Melting” is about an emperor penguin colony in Antarctica. One day, a curious bird (Fred) discovers a potentially devastating problem threatening their home (iceberg), but no one listens to him. The characters in the story (see description down below) all can be found in organizations around the world. Their tale is one of resistance to change and heroic action in the face of seemingly intractable obstacles. 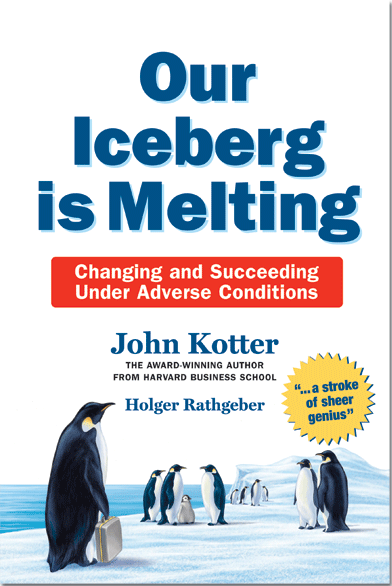 In “Our Iceberg Is Melting” John Paul Kotter reduces and shrinks his 190-page book “Leading Change” into a short fable complete with large print and colorful illustrations about penguins and how they solved their melting iceberg problem. A few years ago Kenneth Blanchard released a book entitled “Who Moved My Cheese”. The book was a great fable about two mice. One thought his piece of cheese would last forever, and never bothered to go and explore and look for new cheese. The other mouse began exploring looking for new cheese, creating new opportunities. Now comes a new fable, one written by John Kotter. In this book, one of the penguins observes that the iceberg that his colony is living on is melting. He must use a vast array of tools to convince the town elders, the critics, the masses and doomsayers that the iceberg is melting and that new options need to be explored. All of the characters in the book, Fred, Ann, Nono, Louis, Jordan, are all based on real life characters. Many of them you will quickly recognize from your workplace and day-to-day life. Knowing that he will need the support of everyone in the community, he gathers together a select group of penguins each with different problem solving skills. Kotter infuses his 8 principles of problem solving in this story. Faced with certain tragedy Kotter shows how the penguins, identified the problem, created urgency, developed a tem-building structure and stepped outside the box. The book is very short, it took me about 90 minutes to read, you will feel energized after reading the book and ready to make some changes in your life and the way that you communicate with others. Fred: Unusually curious, observant, and creative; level-headed; fished less and studied the iceberg and sea more. He was the first to notice the iceberg was melting. Louis: Top penguin and head of the Leadership Council (aka the Group of 10); patient, conservative, not easily flustered, respected by all except NoNo and the teenagers, smart (but not an intellectual heavyweight). He put together the team of himself, Fred, Alice, Buddy, and the Professor to solve the problem. Alice: Member of the Leadership Council; tough, practical bird with a reputation of getting things done, didn’t care about status, impossible to intimidate. She listened to Fred, made the case to the council, and worked to find a solution. Jordan the Professor: Closest the Leadership Council had to an intellectual; well-read, fascinated by interesting questions. He obtained and analyzed information. Buddy: Quiet, boyishly handsome penguin everyone liked and trusted; not ambitious, not an intellectual heavyweight. He communicated the message of change and the solution to the rest of the penguins. NoNo: Older, heavyset bird responsible for weather forecasting. He refused to believe Fred’s dire predictions about the iceberg or participate in any problem-solving activities; he also worked to sabotage possible solutions. Which of the 8 Steps to Successful Change do most organizations seem to have the most difficulty implementing? Why? Some people just don’t see the bigger forces at play because they have their noses to the ground. Some people listen to the change message, but don’t believe it. Some people see the need for change but don’t know what to do. Some people are trying to do something but are running into obstacles. A sliver of people are doing change well. What type(s) of training (both in terms of delivery and content) seem to be most effective in initiating and implementing change? Kotter: When we were developing the Leading Bold Change program, I said to Holger [coauthor and a former trainer], “Be creative, let your mind go wild.” Then I lined up Black & Decker and said, “Here are the concepts, see if you can create something.” I provide the overall vision, and ISB Worldwide facilitates the program. Together, we created something that has the potential to be very powerful. It uses the 8 Step approach, but it trains not by PowerPoint but by sneaking up on you. For example, I gave a speech about change to the top 100 people at a $5 billion company. ISB Worldwide presented the Leading Bold Change program two to three hours after my talk and then the next day. While the CEO and I chatted at the back of the room, these typical executives were howling and throwing plush penguins around. They were being sucked into it and having fun with it. Then they started action planning around an event they wouldn’t forget. So, at the content level is the 8-Step process and getting them to apply it to the situations they’re in. The other level is how to get them engaged and work on this, how to overcome their initial anxiety about change. For example, LBC trainers throw “fish” to people who get the right answer—this creates a middle school attitude and gets them immediately into insights about the nature of change in a goofy way that isn’t scary. Then we start speaking a common language, beginning with the iceberg. Then they get into the characters. Who are you and who are the people around you? Do you have six Professors and one Buddy on your team? That’s not going to wash. We learned in our “Heart of Change” research that visuals are very important, so we have pictures of penguins everywhere. The place is a visual wonderland that keeps you in the story and keeps you out of the cognitive part of the brain. Thus, each group comes in with a shared story, instead of each person with his or her individual story. Ultimately, it builds up to the serious part—the rolling up your sleeves and diving into how do I go about tackling change better. What tips for change would you offer to global companies that are geographically dispersed and cross multiple cultures? Kotter: In smaller companies, the more change programs can cover the whole organization—there’s a direct analogy to the 250 penguins in the book. In global companies, it’s rare to move 42 million people in 72 countries a step to the left. Instead, it tends to work in pieces. I just got off the phone with a person in charge of a U.S. division of a huge company, who said, “We have to get our group going, so we can provide a role model for other groups.” They get something rolling and are noticed by other parts of the company. If you can get different rates of change going, the whole thing starts to move. As for different cultures, this change model is based on human nature and cuts across cultures, sectors (public/private), and generations. Often, employees are open to change but have concerns about their company’s willingness or ability to provide the necessary resources. How does a company overcome those concerns? Kotter: Fears hold people back. They’ve seen people get whacked in the past or they think, “Things are working fine now, so why change?” One way to get by this is to send someone off for three years of psychoanalysis. Another is to find a way to purposely disarm the fears. Humor is great for this. I’m a feedback guy, and I’ve found you can get the audience more engaged by using humor. Some might say that finding another iceberg is not the final solution—it’s just putting off a bigger problem (i.e., what to do about global warming—where do the penguins go when there are no more icebergs?). How do you respond to that? Kotter: The point is that there is no permanent iceberg. Life is going to change, so just get used to it. It can be fun. You can train the next generation to do it better. You’re going to be moving. You may end up living on something other than an iceberg, but even that may turn into an iceberg. The ultimate solution—nomadic existence in which the penguins move from iceberg to iceberg—was our analogy that what sustains you is going to change. What is your own “iceberg” right now? Kotter: My iceberg now is that when you get good at something you are tempted to stay in that box forever. I want to keep creating new things that have broader reach. I’d like to help the world get 100 million people to lead organizations and their own lives better through the work we’re doing. Another of my icebergs is convincing the people working with me to move forward with me. And I only realized in July as I was sitting in the audience of a Leading Bold Change session that my team was not complete. They give you sticky things with the characters’ faces on them and ask you to choose the one that is most like you and stick it on your shirt. Then you have to identify the people around you and match them to characters. At that moment, I realized I didn’t have all the “characters” I need around me to accomplish what I need to accomplish. I thought, “Why in the world didn’t I see this before?” So, I’ve recently made some huge decisions to try to put the missing elements into my team. Imagine seasoned businessmen and women clutching and stroking plush penguins during a training session. It may sound odd, but that was the scene during a Leading Bold Change (LBC) training session for Black & Decker Hardware and Home Improvement Group executives. “Ninety percent of people hate change,” says Bret Skousen, director of employee and organizational development, Black & Decker Hardware and Home Improvement Group. “So people at the session were grabbing the stuffed penguins because they wanted comfort cuddle buddies. They felt better able to deal with the change issue when holding and stroking the stuffed penguins,” which represent the characters in the book, “Our Iceberg Is Melting,” on which the training is based. Step 1: He hit key points of the training, including having iceberg posters everywhere with the penguin symbol under each nametag to create urgency. Step 2: He pulled together the team, then made it cross-functional and branched out from his team to others. Step 3: The team laid out what it was going to do and NOT going to do. Step 4: The team started to communicate with others in the company who would be affected—obtaining buy-in. Step 5: The leader got the right executive team leadership members to support the effort and made them understand the consequences of not doing this. Step 6: They celebrated short-term wins. Step 8: This year, at the global operations meeting in January, the leaders were filmed on where they were at in their change initiatives, so people didn’t think it was just a one-hit wonder from last year. This included executives who said they were planning something and didn’t get it done but now promised to do something this year. In March 2007, Kaiser Permanente charged new Chief Information Officer Phil Fasano with driving the organization’s technology agenda and leading its 5,600 IT employees. Kaiser Permanente’s major health IT initiative, KP Health-Connect—which digitizes and integrates nearly 9 million KP members’ medical and administrative information into a single system—already was well underway. The IT organization was challenged to develop and support KP’s goal for a technology-driven, information-based strategy. But the organization’s brand suffered, and morale was low. CIO Fasano needed to show IT employees how they fit into KP’s “bigger picture” and what behaviors were needed to support the strategy. The CIO went on a series of “listening and learning tours” to launch the organization’s vision and share the strategy. Soon after leaving the two-day LBC workshop, the KP managers decided to use Dr. Kotter’s 8-Step approach to help IT navigate through its transformation. KP employed LBC workshop designer/consultant ISB Worldwide to train the TAG team members in late summer and early fall 2007 with the assistance of the original KP leaders certified through the LBC program. During the sessions, participants reviewed the “Our Iceberg Is Melting” parable interactively, then had fun fishing sessions in which participants caught Gummi bears in their mouths. “This was done to break down barriers and loosen up the room before identifying their iceberg and figuring out what success would look like around each of the 8 Steps,” explains Yolton, who admits to identifying with Buddy “because he took on the role of helping wherever he needed to be and didn’t need to be at the top” and also with Alice “because she’s a pragmatist, looking for the ‘how’ and looking to solve the problem.” Within each workshop setting, the groups were separated into teams that could work on specific team-scaled elements of the overall KP transformation process. At the end of each session, these teams were charged with completing the Leading Bold Change Action Planning document included in the participant guide. The teams were given a 30-day window to report back to their leadership with an action plan for their team’s role in the larger initiative. The monthly TAG team meetings kept the LBC process in motion by discussing each team’s progress and success. Step 1: The group made it clear that if the business objectives aren’t made for 2008 it will impact folks from a professional standpoint: performance plans, compensation, pricing plans, etc. Step 2: The group got its regional leaders to make the goals relevant. This included supervisors and managers—the people doing the work. Step 3: The vision of the organization: Be competitive, provide the best health care at low costs, incorporate IT. Step 4: To communicate, the group used the Intranet, publications, and cascaded the message (managers sat with staff to talk about what the goals mean). Step 5: Everyone had to create a set of goals and input them. Everyone had to have a conversation with their manager to create these goals. Step 6: “We plan to put the successes on the Intranet and celebrate them,” Yolton says. Step 8: “We talk about goals on a quarterly basis,” Yolton says. MasterCard Worldwide’s melting iceberg first surfaced in 2006. That’s when the company went public and began encountering all the changes associated with that milestone in the company’s 40-year history. “We need people who can embrace change and thrive in a world of increased competition, shorter production cycles for new products, rapidly evolving technology, alternate workplace approaches, as well as changing political climates and demographics,” explains Rebecca Ray, SVP, Global Talent Management and Development (GTM&D), MasterCard Worldwide. After successful change-related initiatives in 2006 and 2007, the GTM&D team at MasterCard began crafting a more systematic approach to the way the company talks about change, leads change, and uses the new level of comfort with change as a competitive advantage. This entailed providing all employees with the necessary skills to both lead changes within their business units and the skills to be more receptive to change. In addition to MasterCard executives sharing their insights on change and a resource Website with change-related content, the GTM&D team selected Dr. John Kotter’s Leading Bold Change (LBC) initiative, an interactive by-product of his book, “Our Iceberg Is Melting: Changing and Succeeding Under Any Condition.” It then partnered with ISB Worldwide Corporate Learning Management, co-developer and distributor of Leading Bold Change, to train facilitators and bring the program to life at MasterCard. MasterCard kicked off the initiative with executive sessions to build buy-in and support for driving LBC through the company. Many participants in these sessions subsequently requested LBC sessions with their own teams tied to specific change challenges they are facing on their teams. Pilot sessions have been held globally in Purchase, NY; St. Louis, MO; London; and Brussels since fall 2007. All session participants were required to read “Our Iceberg Is Melting” and complete online pre-work before attending the workshop. During the workshops, executives holding team sessions developed action plans to apply the 8-Step model to their change initiatives. Over the course of the change initiatives, executives and their teams receive consulting services from the GTM&D team on action plan implementation on an ongoing basis. Interactive dialogue on the book and reinforcement of key concepts from it. Identification and discussion of how the archetypes from the book relate to each participant’s leadership style. Video presentation by Dr. Kotter of several corporate case studies on why the 8 Steps are needed and what successful implementation of them looks like. Breakout and group discussion on the past experiences of participants with change initiatives and how they relate to successful implementation of each step. Exploration of the current state of the team or organization, including strengths and weaknesses, and analysis of critical change issues (fissures). Application of the 8-Step model to the identified focus area(s), including completion of a plan and goals for each step. Following the workshops, GTM&D consultants worked with each team to ensure successful implementation of the action plan—in most cases joining regular team meetings, and in some cases conducting additional workshops. So how far has MasterCard gotten with the 8 Steps of change? To increase the urgency for change (Step 1), in November 2007, a getAbstract Chat hosted by Chief Marketing Officer Larry Flanagan involved close to a thousand MasterCard employees via a global teleconference of the key themes of Dr. Kotter’s work and their application to the company. Later that month, employees heard from Dr. Kotter himself, and some posed questions to him during a live broadcast from Linkage. The company’s broad communication efforts (Step 4)—including Intranet coverage of the change initiatives—have been enhanced through its strategic partnership with Worldwide Communications (its internal marketing and advertising team). “We have empowered action (Step 5) by providing all MasterCard employees access to these concepts through a variety of means. By certifying our own GTM&D team and working closely with senior leaders and their intact teams, we are willing and able to assist each business unit with its change initiative as needs arise,” Breitfelder says.